Club Kachori is a quite a famous weekend breakfast dish from the city of Kolkata. Anyone who has lived in Kolkata for a while will know about this quite popular weekend breakfast dish - Club Kachori. This dish is DH's favourite and whenever he is in Kolkata, he doesn't miss to indulge gorging on it for breakfast at a popular snack shop in the locality. These kachoris as deep fried and are served with a spicy potato curry. In some places, pumpkin is also added to the curry. 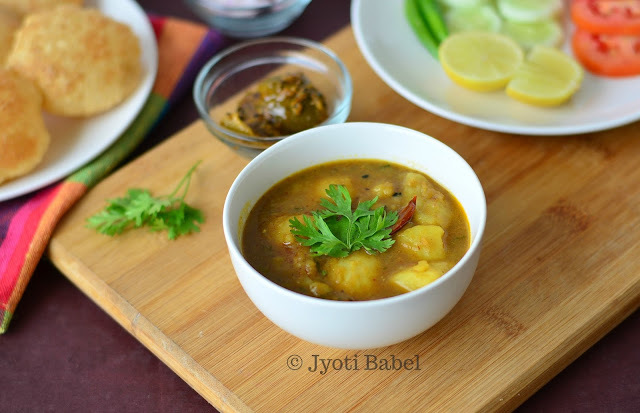 Panchporan - a Bengali whole spice mix added to this curry, makes it taste a little different from the regular potato curry. Typically, maida is used to make the kachoris, but at home, I use atta (chapati flour) to make them. Without much ado, let's check out how to prepare Club Kachori Kolkata style. 1. Drain the soaked urad dal and grind coarsely in a grinder. In a mixing bowl, add the coarsely ground urad dal paste, atta, suji, oil, hing, salt, chilli and ginger and using water as need, knead a firm dough. Cover it and set it aside. 2. To make the potato curry heat oil in a pan, add hing, jeera, red chilli, green chilli, ginger and garlic and sauté for a few seconds. Now add sauf, methi seeds, ajwain, kalonji and rai and stir so that they start crackling. Now add the tomato puree. Cook for about a minute and then add the chilli powder, turmeric powder, salt, and coriander powder. Cook for a couple of minutes. When you see oil leaving its side, add the potatoes. Stir. Now add 1 cup of water. Stir and bring it to a boil. 3. When it comes to a boil, the gravy will also start thickening, add garam masala, amchur and crushed kasuri methi and stir. If needed add little more water, cover and bring to a boil. 4. Check for spices, adjust if needed. When done, add chopped coriander leaves and take it off the flame. 5. In order to make the kachori/puri, divide the dough into small balls (little bigger than marbles). These kachoris are about 2 inches in diameter. 6. Roll them into thick rounds (little thicker than puri). Thin ones do not puff well. 7. Heat oil in a Kadhai and when the oil is heated enough, fry them 2-3 at a time (depending on the size of your Kadhai) on high heat. When it is brown on one, flip and fry the other side for a few seconds. Drain them on paper towel. Repeat the process till you have used all the dough. 8. 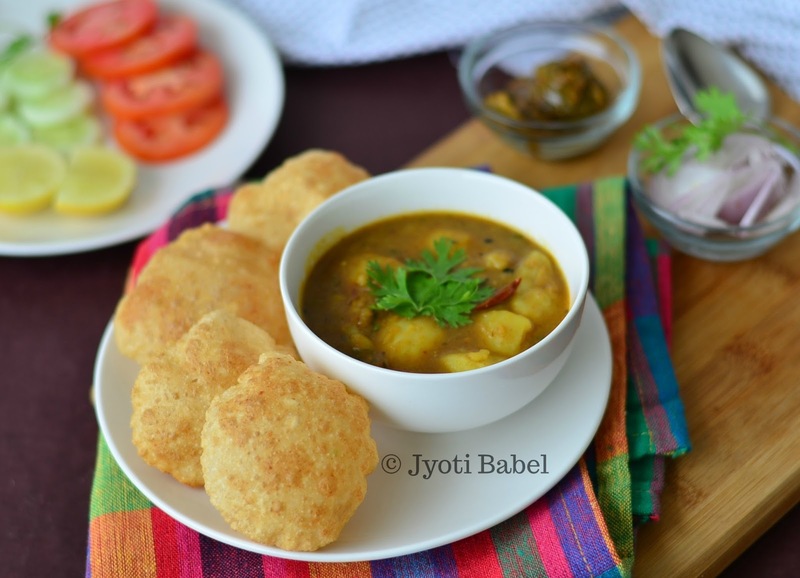 Serve the potato curry with these hot kachori/puri along with a dollop of achar, sliced onion and some tomato and cucumber slices for a filling weekend breakfast/ brunch. 1. Do not roll them too thin or too big, else they will not puff well. 2. Always fry these kachoris on a high heat, it helps them in puffing. Once they puff up, you can lower the heat and fry till they are golden. Love the name of the breakfast dish.. misleading but what an interesting recipe. I've bookmarked it to make it some day for brunch. Interesting , I am hearing the name Club Kachori for the first time . These kachoris sound so much like North Indian Bedmi Saag , where urad daal is stuffed in the pooris. We also have another version where it is mixed in . The sabzi however is little different . The whole set up looks inviting and perfect for drooling over a typical breakfast . This dish is totally new to me and it looks absolutely delicious.Would love to try sometime, so bookmarked. This is so tempting .. The clob Kachori is just perfect! !